Godrej Emerald: Luxury apartments with spectacular features for a life of wholesome goodness! Mumbai is an incredible city in the state of Maharashtra that many want to be a part of. With so much to offer, a life in Mumbai is a life well lived! The real estate industry in Mumbai is thriving with a number of residential projects and commercial projects in different parts of the city. Thane is a fabulous location and a part of the Mumbai Metropolitan Region (MMR) Godrej Emerald is a new residential projects in Mumbai by Godrej Properties Limited that offers a comprehensive lifestyle leaving no stone unturned! Extended over 6.5 acres of luscious land, this residential development contains 6 remarkable towers (S +28) that offer 1.5BHK, 2BHK as well as 3BHK luxury apartments of different configurations that are designed to delight!The apartment carpet areas start at Carpet Area) 525 sq. ft. and go up to 915 sq. ft., providing exclusive luxury space that you will never run short of! With a total of 1400 residential units, you can pick the perfect apartment that will be loved for generations to come. Godrej Emerald Mumbai is an exceptional residential development that speaks luxury from start to finish! The apartments are spacious, provide beautiful ventilation, natural lighting and contain branded fittings & fixtures, premium flooring, plush doors, large balconies and windows providing mesmerising landscape views of lush greens and Yeoor Hills, splendid kitchens with high-quality platforms and multiple provisions, electrical ports and switches for multiple electronics located at the right places, hi-tech safety features and this list just goes on. This development also offers a wide range of world-class external amenities that will blow your mind! Welcome to a world that is packed with fun and entertainment galore! The external amenities include a 2.5 acre clubhouse for recreation, swimming pool that you can just dive-in and relax, well-equipped gym to always stay fit and health, multiple sports facilities and a play-zone for your kids, amphitheatre, landscape garden, 5 acres of open greens, fabulous sit-outs to spend time with family and friends, 24hour water supply, firefighting equipment for emergencies, well-planned car parking facility and well-trained security with video surveillance. Located at Thane, Mumbai, Godrej Emerald Thane offers a life of convenience each day as it has all of your daily and emergency landmarks in close proximity. Places like schools, colleges, institutes, medical centres, hospitals, banks, ATMs, malls, cinemas, shopping centres, convenience stores, supermarkets/hypermarkets, restaurants, cafes, clubs, pubs, lounges, automobile showrooms, water parks, all kind of public transport and a lot more can be accessed without worrying about long-distance journeys. 2 BHK Starting at a price of 99 lakhs., the Godrej Emerald price is affordable and well-planned to meet every budget. May it be a new home or an investment for that matter, an apartment at this development is definitely worth a buy. You can conveniently choose from a number of payment plans along with home loans at decent interest rates, NRI services, additional discounts, customer support and a lot more for a purchase that will be loved and appreciated for generations to come. Very close to Vedant Hospital. The site is located just off Ghodbunder road. The location has an excellent connectivity to both the Western and Central suburbs, and further to Kalyan, Bhiwandi and Nashik through NH3. Thane is also connected to the industrial belt of Bhiwandi, Kalyan and Dombivili. The NH 3 passing via Thane is a high-speed corridor ensuring quick access to the districts of Nashik and beyond. Upcoming 32KMs long Mumbai Metro line 4 from Kasarvadavli, Thane to Ghatkopar & Wadala. 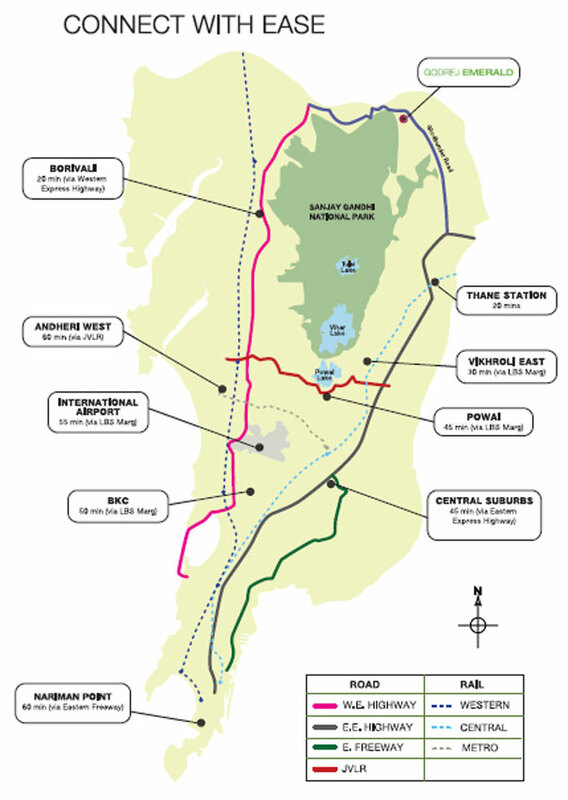 Proposed 10KM long 6 lane tunnel from Thane to Borivali under the Sanjay Gandhi National Park. Proposed Monorail in the Thane- Bhiwandi- Kalyan corridor. 20 mins* from Thane Railway Station. 25 mins* from Borivali Railway Station. Easy access to commercial hubs in Pokhran and Waghbil, which are 15 to 20 minutes* away.